Counting Crows are the perfect example of a great, great band who have suffered terribly from the inevitable shifts in mainstream music. Subtly hidden behind the concrete layers of perfectly-edited guitars and the mountains of perfectly-edited overproduction there lies an exceptional live act, a jam band struggling to find liberation, and one of the finest roots songwriters of his generation. But the crucial word here is “hidden”, and far too often records like Hard Candy and This Desert Life have done their utmost best to diminish all the impurities and the rough edges that ultimately make the music of Counting Crows so uniquely organic. You’d never know it, but in 2 decades Adam Duritz has crafted some of the greatest folk songs around. Goodnight Elisabeth, Omaha, Holiday In Spain, Have You Seen Me Lately were all capable of being pièces de résistance if recorded in another era by, say, The Band. So, to hear the news that they were preparing a covers album should have left an excited taste in the mouths of, well, anybody who cares about the progression of mainstream music. Here was a chance for a popular band to parade forgotten classics to a new audience; a new outlet to re-spread the word of Van Morrison, of Jackson Browne, of Gene Clark, of Bob Dylan, of Jerry Garcia and Robert Hunter. With the colossal fanbase their popularity brings hanging onto every word intently, Counting Crows held all the right tools to push a little of their predecessors back into the mainstream limelight. None of them surpass the originals. However, the unnecessary choices don’t begin with pre-77 songs simply done badly (but don’t worry, there’s lots of that to come). Instead, colourless cuts of trendy no-one-really-cares bands like Dawes and Kasey Anderson are included, and the only question to ask is WHY!? What could Counting Crows possibly achieve by covering songs IN THE SAME GENRE, some of which were released less than 3 years ago? The odd choice of Teenage Fanclub’s Start Again, one of the weaker songs from the Glasgow band’s worst album, is a tedious and stale shadow of the one which appears on Songs from Northern Britain; it sounds like a plodding olympic tortoise racing in the 100m sprint against mutant tortoises with superpowers – that is, even in a race of feeble species, it’s still never going to win. In other words, it sounds exactly like the original, except more dense and will leave you braindead with repeated listens. Meet On The Ledge, archetypically appearing on Fairport Convention’s What We Did On Our Holidays, is transformed into an embarrassing pub singalong. Big Star’s 1972 powerpop treasure Ballad of El Goodo isn’t much better, somehow managing to go from catchy pop gold into rushed and extraneous middle-of-the-road music. But leading the way is Gram Parsons and Emmylou Harris’ Return of the Grevious Angel, something that was never going to be a good choice to cover. The opening track from one of alt-country’s seminal albums, Grevious Angel almost single-handedly inspired a whole movement and genre, so to turn it into a self-important mess is near unforgivable and should be punishable by death. Death by having your ears cut off. Unsurprisingly, the rare highlight on Underwater Sunshine comes in the very likely form of an old Counting Crows b-side (yes, they’ve covered themselves, regardless of the attempts in the liner notes to say it was written for another band.) Four White Stallions works considerably better than the insipid covers on here, proving that, when it does matter, they’re a band capable of producing quality, professional material; a band who thrive much more on their own songs. Though, it says almost too much about this album when Four White Stallions can be found in much better form on the live release New Amsterdam (which ANY fan of music should own in their collection.) But see, the song also exists as a bonus studio track on the European release of 2002‘s Hard Candy too, so who in the band decided that recording a third time for this tired and worn session was a good idea? We can only assume it’s one of their groupie’s favourite songs. It’s hard to see where the audience for this album lies; is it the gullible obsessive fanbase, happy to eat everything up that the band spits out? Is it the near-extinct dying breed of CD shoppers out there, still searching the shelves of record stores and blindly buying solely based on band names and cover art? Probably and most likely. Essentially, this record will allow the band to join the ranks of contemporary pompous indie rock with its wobbling shelf life. But, frustratingly, that seems to be what Adam Duritz wants. Thankfully, this record will be forgotten about in 6 months time when it takes its rightful place in the “rare” section of the Counting Crows discography. And, with some luck, hopefully Adam Duritz’s newfound passion for live-in-the-studio folk music provides a catalyst for wherever the band go next. 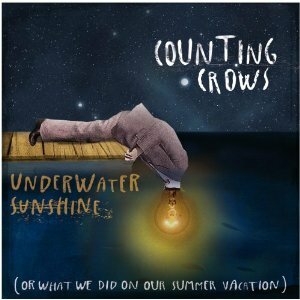 It’s very possible to love the Counting Crows yet still agree that Underwater Sunshine is a terrible mistake. Posted in 2 Stars, Folk/Singer-Songwriter, Roots & Americana and tagged Counting Crows, Covers, Indie, Undewater Sunshine. Bookmark the permalink. Listening to everything so you don't have to. One zealous boy's obsessive and completely unhealthy musical journey. OPINIONS ARE NOT FACT. All strong opinions here are, infact, my own.